John Paul Jr. is an American former racing driver who achieved great success in sports car racing. He was the IMSA GT champion in 1982, winning both classic North American endurance races in that year – Daytona 24 Hours and Sebring 12 Hours. He was a Daytona 24h winner one more time in 1997. He stayed just a step from winning the Triple Crown of endurance racing, finishing second overall at Le Mans 24 Hours in 1984. Besides his success in sports car racing, John Paul Jr. was also active in the open-wheel racing, scoring two wins in CART/IndyCar races, but also in the stock car racing, recording three participations in the NASCAR Cup Series. Besides being famous for his racing success, John Paul Jr. is also known as a son of John Paul Sr., a former racing driver, team owner, convicted felon and fugitive. His father served a long-time prison for a variety of crimes. Following a release from prison in 1999, John Paul Sr. disappeared in 2001. John Paul Jr. also served a short time in prison, from 1986 to 1988, for his involvement in drug trafficking with his father. John Lee Paul Jr. was born in Muncie, Indiana. After graduating from a high school, Paul Jr. started to work for his father's team JLP Racing. First, he was learning about engines, mechanics and team management and then father sent him to the Skip Barber Racing School. In 1979, Paul Jr. made a racing debut with Formula Ford and then in the SCCA National Championship Runoffs and Formula Atlantic Championship. In 1980, father included him in his racing schedule, sharing a car with a son in the IMSA GT Championship but also taking him to Europe to compete at 24 Hours of Le Mans. At Le Mans debut, Paul Sr. and Paul Jr. were sharing the #73 Porsche 935 with Guy Edwards, finishing ninth overall and second in IMSA class. Paul Jr was pretty successful in his first sports car season, scoring several wins and podiums, always sharing a car with his father. In 1982, Paul Jr. made a debut both at Daytona 24 Hours and Sebring 12 Hours, recording two DNFs. However, later in the season, he was on a podium five times, including two wins, finishing second in the final standings of the IMSA GT Championship, behind Brian Redman. 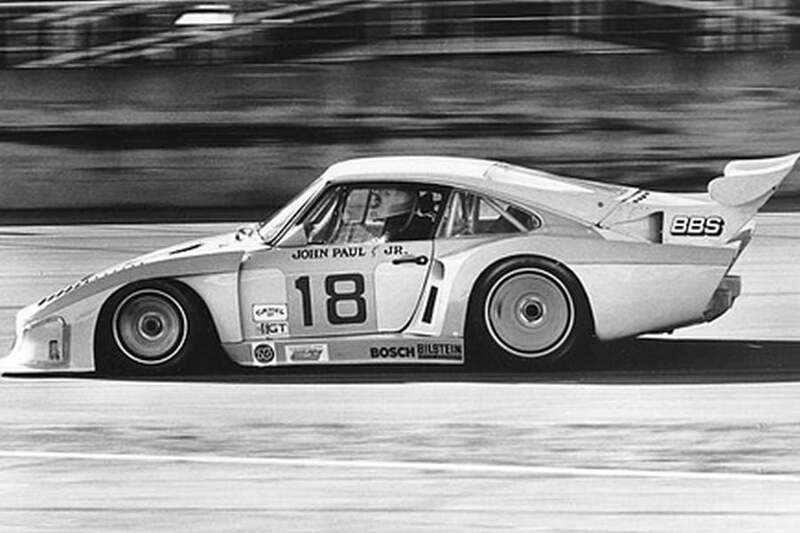 Besides a racing with Porsche 935, Paul Jr. was also using a Lola T600-Chevrolet in some races. Parallel to sports car racing commitments, Paul Jr also competed in the Formula Super Vee USA, scoring one podium in six races. The season 1982 turned to be a dream season for John Paul Jr. He started a year with a victory at Daytona 24 Hours, sharing the #18 JLP Racing Porsche 935 JLP-3 with his father and Rolf Stommelen. In March, another great victory followed for father and son at Sebring 12 Hours. Paul Jr. continued his winning streak at Road Atlanta (twice), Laguna Seca, Charlotte, Brainerd, Portland and Mosport. He dominantly won the IMSA GT Championship trophy. Outside IMSA Championship, he joined Kremer Racing at Brands Hatch 1000 Kilometers, a round of the FIA World Endurance Championship, finishing in the sixth place. In September 1982, Paul Jr. made a debut in the CART Indy Car World Series, participating in Road America's round. In 1983, he spent a full season in the Indy Car World Series, driving for Racing Team VDS. Following a third-place finish in the season-opening race at Atlanta Motor Speedway, he failed to qualify for Indianapolis 500. In the fifth round, at Michigan International Speedway, Paul Jr. scored his maiden Indy Car victory by beating Al Unser, who eventually became a champion. Paul Jr. finished 8th in the points at the end of the season. While racing full-time in the Indy Car, Paul Jr. had a limited schedule in the IMSA GT Championship, participating in just five races. He also made one start in the Trans-Am Series, winning a race at Circuit Trois-Rivieres in a Chevrolet Camaro. In 1984, John Paul Jr. was combining open-wheel and sports car racing commitments. He recorded seven starts in the CART Indy Car World Series with four different teams, finishing best in the third place at Vegas Grand Prix. He failed to qualify for Indianapolis 500 again. The highlight of the season was an overall podium at Le Mans 24 Hours. Paul Jr. finished second in the #26 Henn's T-Bird Swap Shop Porsche 956, narrowly missing to score a Triple Crown of endurance racing. He was sharing a car with Jean Rondeau, losing a victory by two laps to Henri Pescarolo and Klaus Ludwig. In 1985, Paul Jr returned full-time to IMSA GTP Championship, driving March prototypes for Conte Racing or Pegasus Racing. He stayed without wins or podiums for the entire season. In the Indy Car Series, he made just two starts, finally managing to qualify for Indianapolis 500. In his debut at the greatest American race, Paul Jr. was driving the #43 March-Cosworth for AMI Racing, being classified as 15th after crashing on lap 165. In 1986, Paul Jr. made six starts in the IMSA GTP Championship before his career was interrupted with a prison sentence. In May 1986, John Paul Jr has been sentenced to five years in a prison for his involvement in a drug trafficking with his father and a refusal to testify against him. He was sent to a minimum-security prison in Alabama. He served two and a half years in a prison, being released in October 1988. He returned to race track soon after that, in January 1989 at Daytona International Speedway's test for Daytona 24 Hours. In his comeback to racing, Paul Jr. competed with Bayside Motorsports' Porsche 962 at Daytona 24 Hours, not finishing the race. Later in the season, he was driving for four different teams in the IMSA GTP Championship but also made four starts in the Indy Car World Series with two teams. He was on a full-time schedule in the 1990 IMSA GTP Championship, joining Busby Racing to drive the #67 Nissan GTP ZX-T. His co-driver during a season was Kevin Cogan. With three podiums, Paul Jr. finished 8th in the points. After unsuccessful attempt in 1989, Paul Jr. managed to qualify for the Indianapolis 500 in 1990. He finished 16th with Mann Motorsports' Lola-Buick. After that, he became a regular competitor at Indianapolis Motor Speedway, recording five more starts and three DNQs. His best result in the CART period of Indianapolis 500 was the tenth place in 1992 when he was driving the #93 Lola-Buick for Mann Development. Since 1996, the race was a part of Indy Racing League. Paul Jr. improved his best result in 1998, finishing 7th with Team Pelfrey. It was his last race as he recorded two DNQs in 1999 and 2001. Besides regularly attempting at Indianapolis 500, Paul Jr had a wide schedule of races in two Indy Racing League seasons (1996/1997 and 1998). In 1998, he competed with three different teams and scored his second Indy Car victory in a career. Driving the #10 G-Force (Oldsmobile) for Byrd-Cunningham Racing, he won at Texas Motor Speedway, beating Robby Unser. At the end of the season, he was 11th in the points. In 1991, Paul Jr. tried to compete in stock car racing, entering three races of the NASCAR Winston Cup Series. He was driving the #53 Chevrolet for Martin Birrane's Team Ireland. After finishing 32nd at Pocono, Paul Jr was 16th at Watkins Glen. He failed to qualify for the next race at Michigan International Speedway and it was the end of his stock car racing career. Sports car racing always remained Paul Jr.'s main discipline. After spending the 1990 season with Busby Racing's Nissan, he raced with four different cars in 1991 (Porsche 962C, Porsche 962 GTi, Gunnar 966-Porsche, Spice SE90P-Pontiac). In March 1992, he scored GTU class victory at Sebring 12 Hours, driving the #96 Nissan 240TX together with David Loring. For the rest of the season, he was again driving a variety of cars, mostly Joest Racing's Porsche 962C. The next success followed in March 1993, again at Sebring International Raceway. John Paul Jr., Derek Bell and Gianpiero Moretti finished second overall in the #30 Momo Nissan NPT-90. The frequent changing of race cars continued over the following years. In June 1995, Paul Jr. returned to Le Mans for the last time. He was sharing the #30 Chevrolet Corvette ZR-1 with James Mero and Chris McDougall, not finishing the race. In 1996, Paul Jr was driving for Dyson Racing only, spending a season in their Riley & Scott MkIII-Ford. After winning two races, he finished 6th in the points of the IMSA WSC championship. In February 1997, John Paul Jr. climbed for the second time to the top podium spot at Daytona 24 Hours race. He was sharing the #16 Riley & Scott MkIII-Ford with Andy Wallace, Butch Leitzinger and James Weaver but after their car stopped all drivers joined their teammates Elliot Forbes-Robinson, John Schneider and Rob Dyson in the #20 car. At the end, the #20 car won the race and seven drivers celebrated a victory. After focusing more on open-wheel racing in 1998, Paul Jr. joined Corvette Racing in 1999, driving a Chevrolet Corvette C5-R at Daytona 24h, Sebring 12h and Petit Le Mans. In 2000, he spent most of the season in the Grand-Am Rolex Sports Car Series with Dyson Racing but also participated in two ALMS races with Konrad Motorsport's Porsche 911 GT2 and Patriot Motorsports' Dodge Viper GTS-R. In 2001, he was driving Lola-Ford for Konrad Motorsport in one Grand-Am race and then he ended his career at 2002 Daytona 24 Hours, where he was a member of Jacobs Motorsports crew in the Riley & Scott MkIII, not finishing the race. The main reason for Paul Jr.'s retirement from racing was his illness. In 2001, he noticed that his car would not respond the way he thought his hands and feet were telling it to while driving. He was diagnosed with Huntington's Disease, a progressive neurological disorder.